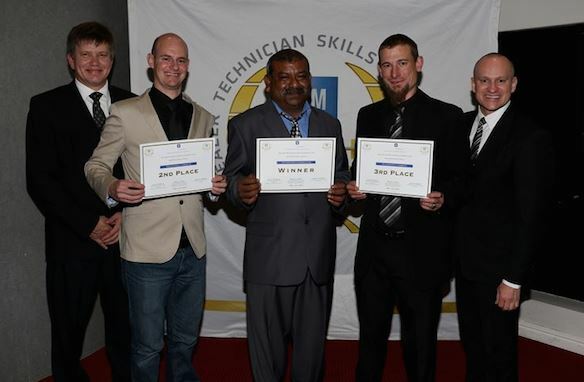 General Motors South Africa (GMSA) has announced the winners of the Top Technician Skills Awards. Govender Dharmalingum (52) of South Coast Motors in Kwa-Zulu Natal scooped the first prize after showing his technical prowess and problem solving skills during four gruelling rounds of the competition. Runners up Stefan de Wet (28) of Reeds N1 City, Cape Town and Quintin Vermeulen (33) of Williams Hunt Pretoria, claimed second and third place respectively. The winners also claimed gift vouchers to the value of R15 000, R10 000 and R7 500. Dharmalingum also won a weekend getaway for two at a South African destination. "Winning the competition was a dream come true for me, but being recognised by the dealer network for your skills and abilities is a huge honour," said an ecstatic Dharmalingum. He added that although the competition was tough, he kept his cool and applied his knowledge to solve the problems accurately and efficiently. Dharmalingum has been employed by South Coast Motors for the past 22 years, said: "I believe that the customer is always right. When I go to work every day I strive to give our customers my best to make sure that they are happy and satisfied with their vehicles." GMSA Development and Training Manager, Dr Alf Bennett, said the competition was fierce and as in 2014, less than 3% separated the top three positions. "We would like to congratulate the winner and the runners-up on a job well done. We look forward to hosting the competition once more in 2016." A joint initiative of the Service Division of GMSA and the National Dealer Council, the competition aims to promote excellence in customer service, technical expertise, and support GMSA's technological innovations in vehicle manufacturing. Brian Olson, GMSA Vice President of Vehicle Sales, Service and Marketing, said the company is reinforcing its commitment to continuously improve service levels at its dealer network in South Africa. "All Chevrolet Opel and Isuzu service centres are equipped with a complete range of equipment and analytical systems to carry out maintenance and repairs." GMSA also provides approximately 40 000 hours per annum of regular and extensive training for all service personnel. Olson said this competition complements the recently launched Compete Care programme to all Chevrolet, Opel and Isuzu customers. "Complete Care demonstrates our commitment to being a leader in customer care, service and satisfaction through one of the most thorough service packages available anywhere. "Our ultimate objective is to drive GM authorised service centres to deliver 'manufacturing standard' service and to ensure transparency in our service procedures." Across its 134 dealerships countrywide, 300 technicians entered this year's challenge. The final rounds of the competition took place in Port Elizabeth and was based on three GM products- the Isuzu KB, the Chevrolet Cruze and the Opel Astra. The finalists were required to diagnose and fix problems within a specified time period. Practical exercises were scored by trained observers. The five finalists who battled it out in the final round were Dharmalingum, De Wet, Vermeulen, Jaun Smit (Simpson's Phalaborwa) and Seun Venter (Tommy Martin).